Originating at the National Theatre of Great Britain, Amadeus was the recipient of both the Evening Standard Drama Award and the Theatre Critics Award. 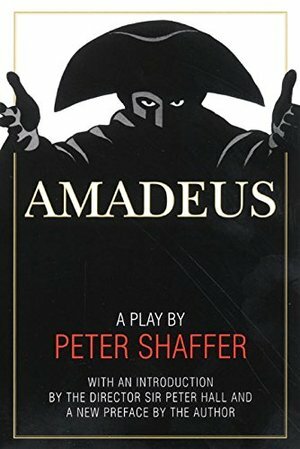 In the United States, the play won the coveted Tony Award and went on to become a critically acclaimed major motion picture winning eight Oscars, including Best Picture.Now, this extraordinary work about the life of Wolfgang Amadeus Mozart is available with a new preface by Peter Shaffer and a new introduction by the director of the 1998 Broadway revival, Sir Peter Hall. Amadeus is a must-have for classical music buffs, theatre lovers, and aficionados of historical fiction. Since most of us will have seen the movie based on this play, it is inevitable to make some comparisons with it. Note that the movie is one of my all times favorite with its attractive story line of two composers coming to grip with their respective talents at the court of the Emperor. The music in the movie is sublime, and well integrated throughout. The story doesn't change much in the play since the play was adapted for the movie, but the play is much more Salieri's own story since in the play he's telling it and addresses the audience directly at many points to explain his thoughts about what goes on, and his lack of understanding as how God could give him so little and bestow so much on someone who doesn't deserve it. He feels compelled to bring Mozart down, and plot his demise (this part of the story stretches the truth since Mozart is likely to have died of rheumatic fever at 35). Performance: I saw this play as a preview at the City Light Theater in San Jose on March 21, 2014. Good cast and good period costumes. Salieri is played by a legally blind actor: although you mostly would never know it although I recognized it when he handled food items (much like my Dad does). Whatever acting shortcomings were subdued by the strong writing. The still-life tableaux at center stage were very effective. The only thing missing was a live orchestra to do justice to the music, although it looks like some of the actors were really playing the piano. It is a small theater (100 seats?) with no reserved seating. I sat in the first row. Sound system was good. Parking is available across the street for $5. The rating refers to the book, not this specific performance.